Michael Friedrickson (left). Steve Kelly (middle) and Sam Fitzgerald (right) At the 2016 Concention. 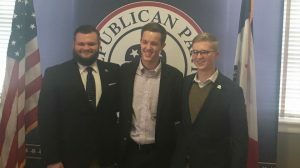 The Iowa Federation of College Republicans held their annual state convention Saturday at Drake University. Outgoing Chair, Steve Kelly of Dordt College handed the reins to the new cabinet. Michael Friedrickson of Iowa State University was elected the new state chair. Logan Kentner (Drake) was elected Vice Chair. Haley Meyer (Loras) will serve as secretary. Ryan Kelly (Cornell) is the new treasurer.